the smartest, easiest way to rent a car. Hertz Ultimate Choice puts you in the driver's seat, making choosing the right vehicle easier than ever. 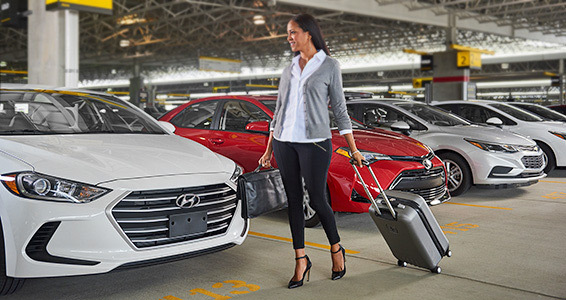 Now available at select airport locations, it's the convenient way to find exactly the car you want and get going. Best part? It's available to all Hertz customers. You no longer go to an assigned car. You decide what to drive. Go to the car zone indicated on your reservation. Choose the car that is right for you. You'll find a range of makes, models and colors to suit you. Just pay a flat fee of $35* more per day and select any car from the Premium Upgrade zone. President’s Circle and Platinum members enjoy a special upgrade rate of $25* per day. All changes will be processed at the exit gate. As a loyalty member, you have access to a select group of cars with enhanced features. Your zone is clearly marked based on your loyalty tier status. All other Hertz customers, simply find the car class zone designated on your reservation and choose the vehicle that's right for you. Want access to exclusive lots? Join Hertz Gold Plus Rewards today. **Check out a sample Hertz Ultimate Choice lot here.